Now for the first time ever, Gene Autry's entire western film career is documented in one book. 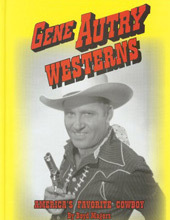 Gene Autry Westerns presents detailed information for Gene's entire Mascot, Republic and Columbia motion picture Westerns as well as his half hour television episodes. Author Boyd Magers worked closely with Gene Autry Entertainment and was granted access to Gene Autry's personal film files, documents, and photo archive to research this amazing book. This book is out of print and sold out. It may be available through used book dealers.